APA Group's takeover offer for Hastings Diversified Utilities Fund is now even less certain with HDF receiving a rival all cash takeover proposal for $2.35 per security less distributions. The proposal values HDF's equity at $1.246 billion. The offer is indicative, non-binding and conditional. It comes from Pipeline Partners Australia Pty Ltd, a consortium that includes Caisse de dépot et placement du Québec (CDPQ) and the Hastings-managed Utilities Trust of Australia (UTA). The conditions include the need for a unanimous recommendation by HDF's independent directors, and acceptance by at least 70 per cent of HDF securityholders. The consortium has up to 45 days for due diligence. Perhaps in recognition of this, APA Group has extended its offer period from 31 May to 31 July. It has also waived another of its conditions. APA currently holds 21.14 per cent of HDF. The rival offer saw HDF's securities jump to a three year high of $2.41. The Climate Advocacy Fund is considering its options for shareholder activism over the upcoming reporting season, and is following up its engagement with Woodside Petroleum to further its resolution of last year. "Over the past 12 months, the Climate Advocacy Fund has been involved in five resolutions. "The first two, which were successful, involved Aquila and Paladin whereby we brought about an improvement in emissions disclosure. The third involved working with Oil Search to bring about their disclosure of an emissions reduction target. "Next, was Woodside Petroleum, whereby we caused them to admit that climate change is a material risk (albeit regulatory), and they agreed to a framework for disclosure. "Finally, we participated in a resolution to ANZ which had been championed by some of our clients. "The first three and ANZ were done as Standard Resolutions. The current law is relatively weak and allows companies to reject these resolutions too easily. Woodside was done by Constitutional Amendment but other institutional investors were uneasy about the method used and did not support us, so we were not as successful as we could have been. "Following Woodside's response, in conjunction with a number of institutional investors, we took the view that it was premature to issue a new resolution for this year's AGM as time didn't permit between the release of their sustainability report and the AGM papers. There were a number of issues raised in Woodside's response that required clarification, not least of which was the fact that the regulations were not out yet. To that end, we are now engaging with Woodside in conjunction with some institutional investors and believe that a more constructive engagement is a critical part of the advocacy process, including ultimately its success in changing the legal and ethical framework around shareholder advocacy. "We are now considering our options for the upcoming reporting season." Meanwhile, the Fund's manager, Australian Ethical Investment, has issued a statement in regard to the move by some of its own shareholders to spill the board. In a letter to shareholders, chairman Andre Morony, said the board had sought legal advice on a letter by shareholder and former director Howard Pender "and has formed the view that it is defamatory". prepared and lodged a submission for federal funding on behalf of AEI," wrote Mr Morony. "In the opinion of the Board, after taking legal advice, that submission contained information that was misleading and deceptive and could have breached the Commonwealth Criminal Code 1995. This action threatened the most precious asset an investment company like AEI has, our reputation. "Another of Mr Pender's proposed directors is Mr Paul Ronald Ralph, who in 2010 was found by the Federal Court of Australia to have breached his duties as a director of another company." Mr Morony invited shareholders to contact him to discuss any aspect of the company. Qube Logistics' subsidiary Prixcar Services Pty Ltd is to acquire the vehicle distribution business operated by Toll Ltd.
Qube owns 25 per cent of Prixcar indirectly through its 50 per cent shareholding in "K" Line Auto Logistics Pty Ltd (KLAL) with Kawasaki Australia owning the other 50 per cent of KLAL. KLAL and Toll each own 50 per cent of Prixcar. Qube's share of the equity funding is expected to be $20 million. Although the transaction is strategically important for Prixcar, it is not expected to have a material impact on Qube's earnings. CMA Corporation shares fell to an all time low of 15 cents on 16 May. Sholz Invest GmbH's interest in CMA has increased from 42.3 to 47.8 per cent. CO2 Group reported a record net profit after tax of $1.6 million for the half year to 31 March 2012. This compares to a profit of $1.5 million for the previous corresponding half. Revenue was up 117 per cent to $32.7 million. Basic earnings per share were 0.42 cents. CO2 has cash of $32.6 million and no debt. No dividend was declared but the board said it continues to review its dividend policy. CO2 Group has continued to diversify into new areas of environmental services including forestry mapping and management, environmental trading, mine site rehabilitation, carbon accounting and inventory management activities. The environmental trading division Carbon Banc saw revenue of $17 million. Carbon Banc's customer numbers are now over 110, with deal numbers passing 300 spot and forward based contracts. During the period, the company established new carbon sink plantings for Woodside Energy and Bundaberg Drinks. Preparations are advanced to establish a further 4,100 hectares in the 2012 planting season, taking total plantings to 26,400 hectare  an 18 per cent increase. Chief executive officer Andrew Grant said "This is a pleasing half-year result for CO2 Group, as the company continues to deliver strong revenue and profit growth, along with a strong cash balance and reflects the benefits of our diversified range of environmental services. The revenue growth shows that we continue to benefit from our long-term contracts which deliver stable and recurring revenues." CVC Sustainable Investments is no longer a substantial shareholder in Environmental Group, having sold 23.8 million shares for $1.66 million. 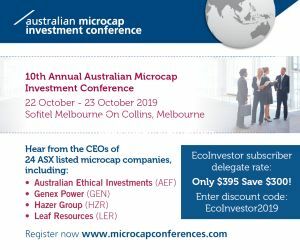 Australian Ethical Investment, the manager of the Australian Ethical Smaller Companies Fund, has issued a statement in regard to the move by some of its shareholders to spill the board. Carbon Conscious said timely seasonal rainfall has led to it commencing the 2012 planting season, in which it will plant 10,000 hectares of mallee eucalypt trees in the Australian wheatbelt. Chief executive officer, Peter Balsarini, said Carbon Conscious has received a client payment of about $5 million for planting commencement and will receive another $5 million on completion. Mr Balsarini said "At the completion of the 2012 planting program, Carbon Conscious will have approximately 19,000 hectares of plantings under management across Australia and New Zealand. Ongoing contract revenue associated with existing projects will exceed $43 million over the next 15 years." "We are seeing growing interest from a range of sources seeking our internationally compliant carbon credits. As more countries develop carbon pricing mechanisms, such as South Korea's new cap-and-trade emissions trading scheme, there is increasing appetite for global carbon offset investments. Clean Seas Tuna shares fell to a all time low of 3 cents on 18 May. Intermoco shares have stayed at the ASX minimum of 0.1 cent and when Eco Investor checked there were no buyers and plenty of shares for sale. Shares in Phoslock Water Solutions fell to an all time low of 5 cents on 15 May. Galaxy Resources has welcomed a decision by Rockwood Holdings Inc, one of the world's largest manufacturers and suppliers of lithium-based compounds and a global price setter in the lithium market, to lift global lithium salts prices by US$1,000 per metric tonne. Analysts First Analysis Securities Corporation said it estimated US$1000/tonne would equate to a 22 per cent increase in prices, based on a basket of lithium commodity products, and with some variations on each product. "We believe this [price increase] suggests relatively tight supply and demand in the lithium industry, which is reasonable." It is the second time Rockwood has hiked lithium salt product prices in the last two years , having announced a 20 per cent increase in June 2011. Rockwood said the price increases would allow it to fund investment projects and expansion plans and cited the electric vehicle market as a future growth area for lithium products. AnaeCo has signed a Memorandum of Understanding with Dynagreen Environmental Protection Group Co of China to collaboratively exploit AnaeCo's DiCOM technology in China and overseas. The agreement agreement between AnaeCo, Dynagreen and its parent Beijing State-Owned Assets Management Co., Ltd (BSAM) will include the terms under which AnaeCo will provide technology transfer and licensing rights to DiCOM and Dynagreen will roll out the network across China. Managing director and CEO Patrick Kedemos said "The DiCOM technology offers compelling advantages as a waste management solution to many of China's large and growing urban cities, where the smaller footprint and environmentally benign nature of the DiCOM process will enable the plants to be located in the cities' light industrial areas. In addition the biogas and the organic fertilizer produced will make a great contribution to Municipalities striving to meet the environmental targets laid down by the Central Government, he said. EcoQuest chairman Sylvia Tulloch and fellow director Gina Ferro have resigned as directors. Darren Olney-Fraser has been appointed executive chairman, and Howard Digby and Peter Webse as new non-executive directors. Mr Digby is an engineering with 23 years in management in Australia and Asia Pacific, mostly in the information technology industry including with IBM. Mr Webse, who is also company secretary of Eco Quest, is an accountant and company director. He has over 21 years experience in company secretarial roles for listed and unlisted companies. European Gas has completed a gas flow test at the Folschviller-2 well in northeast France that indicates the commerciality of its coal bed methane (CBM) projects in the Lorraine region. The Folschviller-2 well was the first multi-lateral horizontal CBM well in continental Europe. Hydraulic fracturing was not used in the well. The study supports commercial development and identified uncertainties that will be addressed in a future drilling campaign. K2 Energy has completed a placement of 31.333 million shares to institutional and sophisticated investors at 3 cents per share to raise $940,000. The proceeds will fund further investment in Mears Technologies Inc. and provide additional working capital. Upon K2's investment, Sam Gazal, chairman of K2, will join the board of Mears, which has plans to merge with K2. "Funds raised from the placement will contribute to the commercialization strategy and activities of Mears' chip technology with clear milestones set in place over the next 6-9 months," said Mr Gazal. Foster Stockbroking Pty Ltd acted as lead manager to the Placement.